Release the Karaqan! How does Aquaman’s latest foe stack up against real ocean giants? It’s been more than 2 months since we last discussed the patron saint of Southern Fried Science, the one and only Aquaman. The Atlantean übermensch has a new lead writer, Jeff Parker, who’s teamed up with Aquaman veteran Paul Pelletier to produce an engaging and visually stunning story. After the epic conclusion to Throne of Atlantis, Aquaman is off on an entirely new adventure. Unfortunately, this new quest puts our hero in the path of a gargantuan guardian of ancient Atlantis, the Karaqan! The Karaqan is big, but just how big is it? How does the Karaqan stack up against living sea creatures? Could an arthropod ever get as big as the Karaqan? Most important, if Aquaman does successfully slay the Karaqan, just how much Old Bay would we need to steam it? How big is the Karaqan? The Karaqan is massive. It crushes buildings, tosses boats like toys, even swallows submarines. But how big is it? We don’t get a lot of whole body perspectives, but, fortunately, in one panel Aquaman’s trident is conveniently aligned with the creature’s length. From a rough estimate of 2 meters for the trident, the Karaqan would stretch out to an impressive 24 meters tall and that’s not including its tail or any appendages below water. Unfortunately for the city of Reykjavik, the Karaqan is almost as broad across the… ischia..? coxae..? Let’s go with first abdominal flanges (‘shoulders’ if you want to think of this thing as a bipedal tetrapod, which you should not). To round off our size estimates, the Karaqan also appears to be about 16 meters ‘deep’. Now that we know about how big the creature is, the next obvious question is how much food can you get out of a single Karaqan? The Karaqan borrows traits from many different taxa, from molluscan tentacles to polychaete feeding appendages, but its overwhelming features appear arthropod in origin. It’s hard not to look at the cranial carapace, with its lateral spines, and not think Callinectes sapidus, the blue crab. An idealized blue crab weighs about 0.15 kilograms, is 15 centimeters wide, roughly 4 centimeters tall, and about 7 centimeters long. The Karaqan is a pretty boxy beast, so, since we missed a bit of the creature below the water line, let’s assume our monster is a 24 by 24 by 16 meter cuboid. If we were to build a Karaqan entirely out of blue crabs, it would stand 600 crabs tall, with 160 crabs across the first abdominal flanges, and a girth 229 crabs deep. If you’re doing the math for your next crab pickin’, that’s about 22,000,000 blue crabs (or 440,000 bushels, if the crabs are big, but not huge). With a population just north of 320,000, every person in Iceland could walk away from Aquaman’s epic fight with 1.3 bushels of Karaqan. To cook the Karaqan right, Iceland would need to import 200 metric tons of Old Bay. That may seem like a lot, but every year Old Bay sells enough seasoning to cook 14 Karaqans. Fortunately, the creature is considerate enough to steam itself when killed. How does the Karaqan compare to other ocean giants? With a body length of 24 meters, the Karaqan is in the company of some real-life ocean giants. A big sperm whale can push 20 meters in length, but it is the blue whale, an animal that can grow up to 30 meters long, that holds the record as the largest animal that has ever lived. 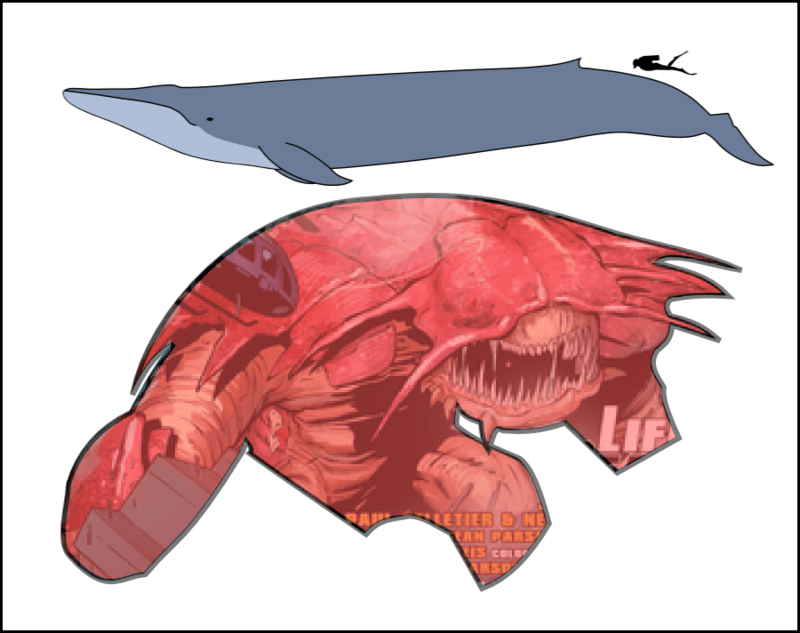 Whales are a bit more streamlined than ancient Atlantean monsters, so while a Blue Whale is roughly torpedo shaped, the Karaqan is about as wide as it is long. Blue Whales have the height advantage but the Karaqan tips the scales at 3300 metric tons, compared to big Blue’s paltry 170. Human, Blue Whale, Karaqan. Modified from a wikimedia image by Kurzon and Aquaman #27 by DC Comics. One of the interesting question s about whales is not “why do whales get so big?” but rather “why don’t whales get bigger?” What limits size among the largest animals in the world? Dr. Craig McClain over at Deep Sea News addressed this in his article Why are there no Super Whales? Whales are limited by their feeding abilities, but not in the way you think. The biggest whales are baleen whales, they filter-feed using a series of mesh-like teeth that allow them to engulf and capture some of the tiniest prey in the ocean. Big whales have big appetites, and the larger they grow, the more food they need. Karaqan mouth tentacles? Aquaman #27. DC Comics. If you’re a whale, the easiest way to get more food per gulp is to grow a bigger mouth. But bigger mouths have trade-offs. They increase drag, making swimming and diving more energetically demanding, which reduces the efficiency of feeding. Investing in a bigger head and mouth means there’s less energy available for developing large, powerful tails. At some point, the energy required for feeding will exceed the energy gained from feeding. And thus, we hit the upper size limit for baleen whales. There probably won’t be any animals bigger than a Blue Whale that feed like a baleen whale. The Karaqan is not a baleen whale. It is a large and clearly voracious predator with… diverse feeding techniques. Generally, high-trophic-level predators are more size-limited, yet the Karaqan dwarfs the largest real animals in the ocean. We know something else about Karaqan feeding: it’s chemoautotrophic. The Karaqan laid dormant for thousands of years, absorbing the energy from hydrothermal vents, a tried and true strategy for deep-sea organisms around the world. “It’s been absorbing thermic energy from the magma vents, converting that to mass.” Aquaman #27. DC Comics. This is actually a pretty efficient strategy. 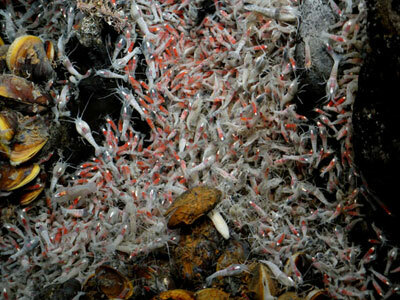 Riftia pacyptila, the giant deep-sea tube worm, survives exclusively off the chemical energy from hydrothermal vents. These tube worms don’t even have digestive systems; rather, they have specialized chambers called trophosomes that contain specialized bacteria which supply all their energy needs. Riftia pachyptila is the fastest growing invertebrate and can reach lengths of 2.5 meters during its lifetime. In contrast, Lamellibrachia luymesi, another deep-sea tube worm, though one that lives at methane seeps, is among the slowest growing invertebrates. While it can grow to almost 3 meters long, it takes more then 250 years to accomplish that task. The good news for the Karaqan is that there’s precedence for both great size and great age by relying on hydrothermal vents for sustenance. Rimicaris exoculata in the Logatchev Vent Field. Photo credit: Ifremer. The Karaqan is pretty clearly an arthropod, with a heavy, chitinous shell and well-defined segments. The tentacle-looking appendages may throw you for a loop, making you think mollusk or polychaete, but make prefect sense if we return to the hydrothermal vent. Behold Rimicaris exoculata, an eyeless vent shrimp that “farms” chemosynthetic bacteria inside its carapace and harvest them using jointed, but tentacle-like, rakers. 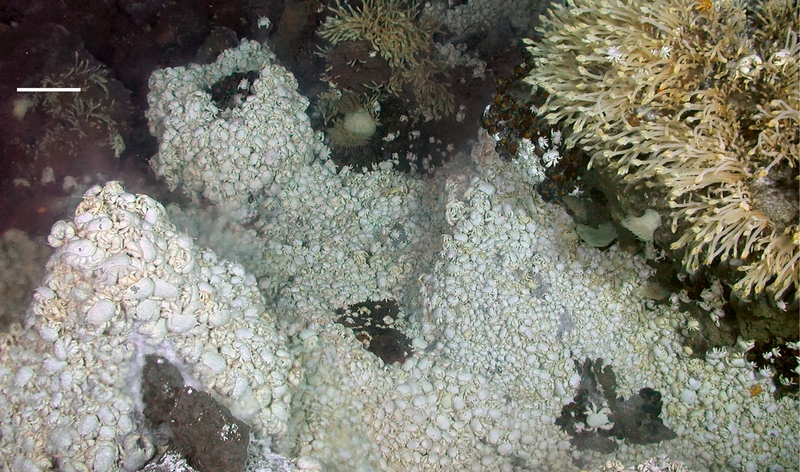 Hoff Crabs and Stalked Barnacles on the East Scotia Ridge. NERC. If the internal rakers aren’t tentacular enough for you, take a look at the darling of the deep sea, Kiwa hirsuta, the Yeti Crab. Yeti crabs are actually squat lobsters, a taxa common throughout the deep sea (look for my paper on Munidopsis lauensis, a non-yeti squat lobster from the western Pacific, coming out later this year). The unfortunately-named ‘Hoff’ Crab dominates vents on the East Scotia Ridge. And those hair-like filaments? They are used to farm bacteria that either detoxify the surrounding sea water or are harvested for food. Many squat lobster are also either predators or scavengers, so some may pack the one-two punch of being both chemoautotropic and voracious predators, just like our friend the Karaqan. Coconut crabs at Bora Bora. Image by Brocken Inaglory. Arthropods are not generally known for reaching massive sizes, though there are some exceptions. The giant deep-sea isopod, a perennial favorite around this blog, can reach nearly 3/4 of a meter, several orders of magnitude larger than its roly-poly cousins. The coconut crab is a giant, terrestrial relative of the hermit crab that can stretch out to nearly one meter, leg-to-leg. They’re big, but they aren’t Karaqan big. To find the biggest arthropods that ever lived, we have to take a trip way back in time. There are two contenders for largest arthropod that ever lived: Arthropleura and Jaekelopterus rhenaniae. Arthropleura is a prehistoric millipede that roamed the plains of North America and Scotland 340 million years ago. At 2.6 meters, this massive herbivore is the largest terrestrial arthropod that ever lived. Arthropleura model. Photo by Sailko. Arthropleura is a poor fit for our semi-aquatic monster, especially when compared to the other contender for largest arthropod, Jaekelopterus rhenaniae. Jaekelopterus belongs to a group of extinct arthropods called Eurypterids or sea scorpions. These ancient hunters are the ancestors of modern terrestrial scorpions, and possibly all arachnids. Jaekelopterus cruised through the shallow, Devonian seas, stalking prey with its enormous, meter-wide chelicerae (claw-like appendages). Jaekelopterus was a vorcious predator, probably the dominant hunter on early Earth. Jaekelopterus rhenaniae. From the BBC. Jaekelopterus rhenaniae was big. At approximately 2.5 meters, this primeval predator easily tops the scales as the most massive arthropod to ever live, and an obvious contender for the ancestor of Aquaman’s latest challenge. Why don’t we see gigantic arthropods today? These creatures dominated the early earth, from the Silurian the the Carboniferous. One possible hypothesis is that during this era, the partial pressure of oxygen was higher, making it easier for arthropods and other animals with open circulatory systems to grow larger; oxygen diffusion was more efficient than it is today. Another possibility is that the evolution of the vertebrate jaw (sea scorpions dominated a world without jaws) resulted in more efficient predators that were able to out-compete and outright prey on eurypterids. The last survivors of these ancient taxa vanished during the Permo-Triassic Extinction, the Great Dying, 250 million years ago, where 9 /10 of marine species and 7/10 of terrestrial species went extinct. Perhaps the Karaqan, or its ancestors, survived the Great Dying and lived on, protecting the ancient city of Atlantis from her enemies. Though Aquaman slayed the beast, a part of the Karaqan survived, and I can’t wait to see where this story leads. In addition to writing about the oceans and Aquaman, Andrew David Thaler is also the author of two works of maritime science fiction: the novel Fleet and the follow-up novella, Prepared. How I talk about science in fiction. Book review: are dolphins really smart? Fun fact – “Karakand” is the name given to slipper lobsters by Galileean arabic fishermen.